Greece international Georgios Bogris finished off play after play for Iberostar Tenerife on Wednesday night on his way to a team-high 22 points as the Canary Islanders stunned Sidigas Avellino, 76-75. The 27-year-old, who helped the Spanish club snap a two-game losing streak in Group D, was so good that he has earned the honor as the Gameday 6 MVP. Bogris made 11 of 15 shots and also corralled 7 rebounds, handed out four assists and came up with two steals in the latest thriller of the competition. A 3-point play by Davin White with just 2 seconds remaining lifted Iberostar Tenerife to the improbable victory. The performance in Italy gave Bogris, who was just coming up of a season-best 14 points in a defeat at Oostende, an impressive efficiency rating of 28. 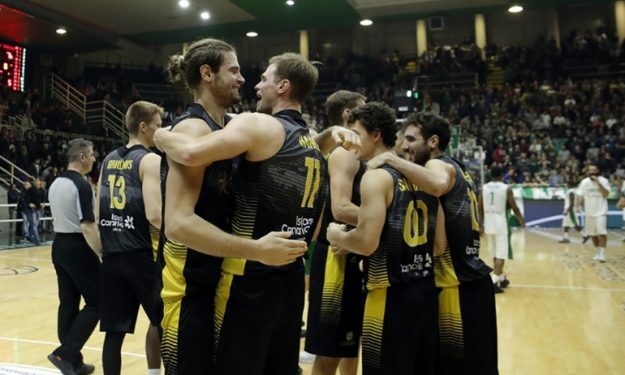 The win has left Bogris and Iberostar Tenerife at 4-2 – the same record as Avellino.